Chapel Hill Meets the Development Agreement Technical Team! This past Wednesday and Thursday (June 26-27), the Development Agreement Technical Team traveled to Chapel Hill to meet with the Community, Town Staff and Glen Lennox development team to discuss the big issues that will frame the next steps in the Glen Lennox development process. The Team, made up of experts in economic development, planning design and development, legal, and environmental and transportation planning, learned about the history of development in Chapel Hill and the Glen Lennox neighborhood. 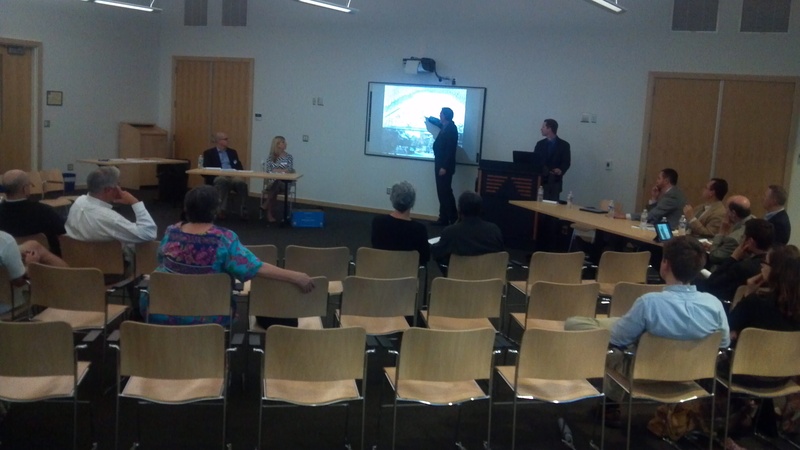 They were introduced to the great work the Glen Lennox Area Neighborhood Conservation District Development Committee did to conceptualize the Glen Lennox of the future. The Team was excited to see all the work the community has already done! At Wednesday night’s public input meeting, Staff Project Team member Jason Damweber introduced the Technical Team and gave a brief overview on development agreements. Following the staff presentation, Technical Team member Victor Dover spoke about redevelopment best practices from around the country. Rachel Russell from Grub Properties wrapped up with a presentation on the highlights of the Glen Lennox Area Neighborhood Conservation District Plan. Community members had a chance to ask questions of the technical team, staff, and Grubb properties. 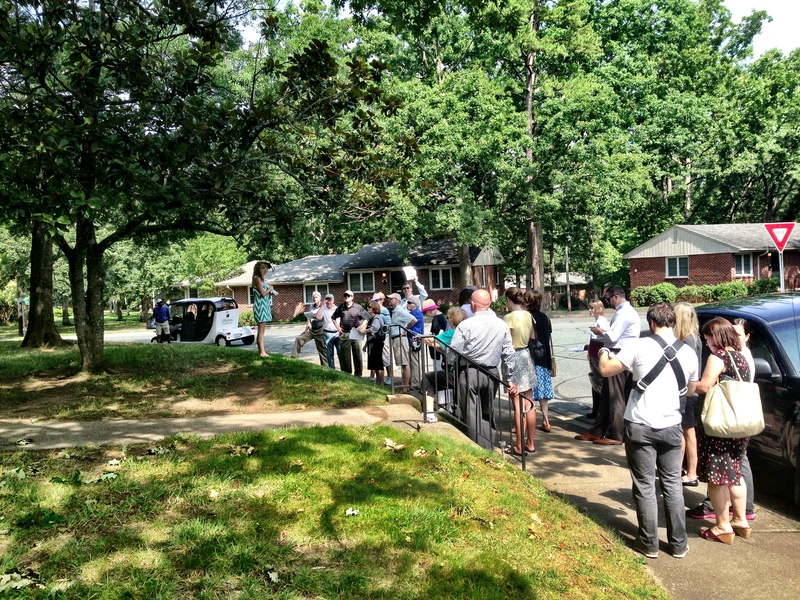 The next day, Rachel Russell of Grubb properties led a public tour of Glen Lennox so the team and community members could see the property and imagine a redesigned Glen Lennox neighborhood. The Town of Chapel Hill’s DESIGN 2020 will offer the special topic presentation, “Development Agreements in Chapel Hill,” by David Owens, professor of public law and government at the UNC-Chapel Hill School of Government at noon on Wednesday, June 19, in the Council Chamber of Chapel Hill Town Hall, 405 Martin Luther King Jr. Blvd. Professor Owens will present information about development agreements in North Carolina, including a general overview of what a development agreement can do and the basic requirements. A development agreement is a unique tool that may be useful for large projects that will be built over a period of up to 20 years. It provides the developer a level of certainty about what it can build and what mitigation measures will be required, if agreement is reached. It also provides the Town with the opportunity to look at the long-term horizon and make sure it fits with the Town’s comprehensive planning efforts and local policies. The presentation will be aired via streaming video at http://www.townofchapelhill.org/video and will be broadcast on Gov-TV 18 later in the week. 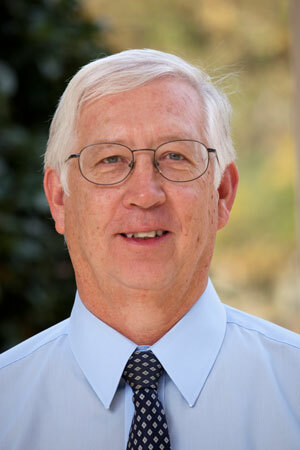 David Owens joined the UNC School of Government in 1989. Prior to that, he was an attorney and senior planner for the Wisconsin State Planning Office and spent 10 years with the NC Division of Coastal Management. His publications include numerous books and articles on zoning law, including the basic legal reference, Land Use Law in North Carolina, and the widely used guide for citizen boards, Introduction to Zoning. He has also written on a variety of land use law topics, the scope of local government authority, urban growth management, regulation of religious land uses and adult businesses, conflicts of interest, planning legislation, and various aspects of coastal management law and policy. Owens received a graduate planning degree and law degree from UNC-Chapel Hill. The Town of Chapel Hill’s Special Topics series began during the Chapel Hill 2020 comprehensive planning process as a way to share information with interested residents who want to know more about issues, trends and studies that affect the future. These presentations continue with DESIGN 2020, the implementation phase of advancing the comprehensive plan’s goals and objectives. DESIGN 2020 will offer the special topic presentation “Economic Development in Chapel Hill” by Town of Chapel Hill Economic Development Officer Dwight Bassett at noon Wednesday, May 15, in the Council Chamber of Chapel Hill Town Hall, 405 Martin Luther King Jr Blvd. Bassett will present information a general view of economic development in Chapel Hill, including facts and information about retail, housing and office markets. He will provide an overview of some of the key projects now under way including Ephesus Church-Fordham, Rosemary Imagined, and Downtown Chapel Hill. Concepts from the Downtown Framework and Action Plan also will be discussed. Bassett is the Town of Chapel Hill’s first economic development officer, hired in 2007 to develop a clear economic development strategy. Learn more about Chapel Hill’s economic development strategy at www.townofchapelhill.org/index.aspx?page=1069. To access economic development studies and data, visit www.townofchapelhill.org/index.aspx?page=2063. Office, housing and retail studies were completed to benchmark Chapel Hill for future economic development and to inform the Town Council of information to help in making decisions about our future. Join the Central West Steering Committee and your fellow community members for the upcoming Central West Community Workshop! The Town of Chapel Hill will hold the Central West Community Workshop from 9 a.m. to 12:30 p.m. Saturday, May 18, with sign-in at 8:30 a.m. The workshop will be in Meeting Room B at the Chapel Hill Public Library, 100 Library Drive. The purpose of the workshop is to gather the community’s thoughts and feedback about the draft planning principles, objectives, and planning concepts for the Central West Focus Area. The Central West Focus Area Steering Committee has developed a draft set of planning principles and objectives that define the important elements to be considered while developing the small area plan for the Central West Focus Area. The planning principles include statements about the importance of connectivity, pedestrian and bicycle safety, identity/sense of place, mixed uses, diversity, green environment, and others. In addition, the Central West Steering Committee has also begun developing different planning concepts which provide visuals of the locations of the different uses in the area. The Central West Focus Area Steering Committee was charged by the Council to develop recommendations for a small area plan for the Central West Focus Area that would address the appropriate uses, form, and intensity for the area. The Committee is to work with the community, Town staff, and a consultant, and the thoughts and ideas developed from this process will form a small area plan which if necessary, will be developed into new zoning regulations for this area. Please help spread the word about the Central West Community Workshop to your friends, neighbors, and colleagues! For more information about the Central West Focus Area process, visit www.townofchapelhill.org/centralwest. The Town of Chapel Hill will host a Central West Community Drop-By Session from 5:30 to 7 p.m. Thursday, April 25, in Meeting Room B of the Chapel Hill Public Library to receive public input about proposed planning principles for the area along Martin Luther King Jr. Boulevard and portions of Estes Drive. 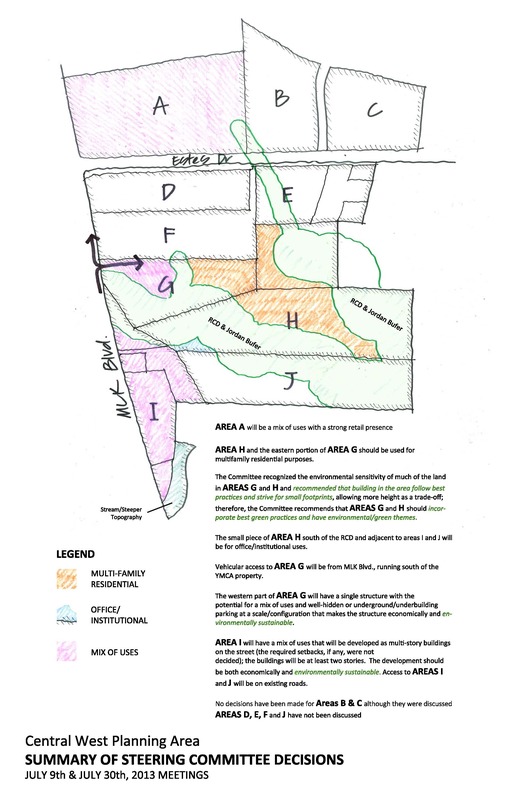 The Central West Focus Area Steering Committee has developed a set of planning principles that define the important elements to be considered while developing the small area plan for this area. The planning principles include statements about the importance of connectivity, pedestrian and bicycle safety, identity/sense of place, mixed uses, diversity, green environment, and others. During the Community Drop-By Session, community members can speak with Steering Committee members and Town staff about the planning principles and provide their feedback. Central West Focus Area is on Flickr! Do you like to keep up with what is going on in the Central West Focus Area? Do you like photography? If you answered yes to both of these questions, then you should consider joining the Central West Flickr page! The Central West Flickr site allows you to view pictures of the area that other members have posted, and to add your own photos to the collection as well. We encourage you to go check out the Flickr site and see what others are posting about the Central West Focus area. While you are browsing around the site, take time to explore the many features that Flickr has to offer. You can provide captions for your photos and label them with tags to give viewers a better sense of how your photo relates to the focus area. Flickr also has a mobile app for smartphones, enabling you to view and post pictures when you are on the go. So, the next time you are wandering through the Central West area and see something that you would like to share with the group, snap a picture and upload it to the Flickr site! The Central West Flickr site is meant to be a useful AND fun tool in this process, so be sure to take advantage of it!